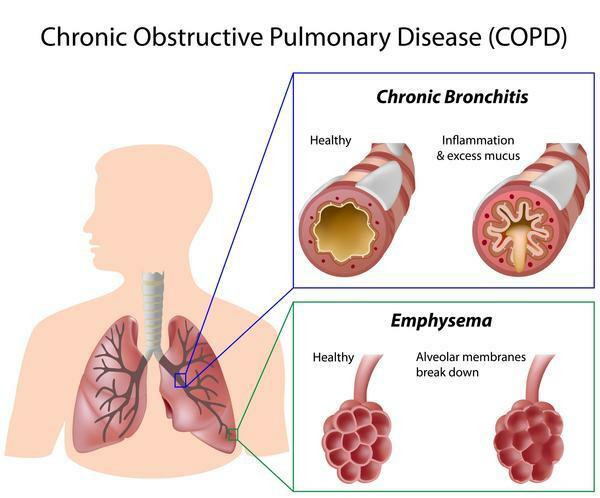 COPD is a progressive (i.e. gets worse with time), chronic, inflammatory lung disease obstructing air-flow to the lungs, mainly caused by breathing pollutants. ✔ CHRONIC bronchitis. The constant irritation/inflammation of the MUCUS MEMBRANE LINING (epithelium) of the bronchial airways (bronchi/bronchioles, which carry air to and from the alveoli of the lungs), causes it to swell and produce mucus, which narrows the airways, making it harder to breathe; a cough ensues to try and clear the mucus.